After getting requests on a summary of what came out of the recent MobiMOOC course, I gladly share this post with you all. 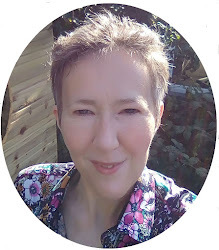 This post is all about mLearning resources and what was/is learned during the MobiMOOC that ran from 2nd April - 14 May 2011. In addition to the MobiMOOC resources, I gladly share the third Beta-version of a MOOC guide on how to set up your own MOOC. The guide is written as a wiki, to enable all MOOC'rs to add to it. You can edit the MOOC guide, by requesting to join the wiki. After you have joined the wiki, you will have editing rights and be able to add your ideas. 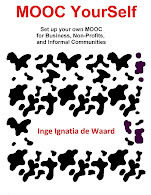 MobiMOOC was a course designed following the natural pathways of a MOOC (or Massive Open Online Course). Ideally I will be embedding all these content and resources into a WikiVersity page soon. The mobimooc wiki gives an overview of all the topics of each of the six weeks of the course. The topics included an introduction to mLearning (facilitated by me - Inge de Waard), planning mLearning projects (facilited by Judy Brown), mLearning in development regions (facilitated by Niall Winters), leading edge mLearning (facilitated by David Metcalf), global context of mLearning (facilitated by John Traxler) and mLearning in k12 (facilitated by Andy Black). To enable discussions between the MobiMOOC participants, we used MobiMOOC Google groups. This works like a list server, enabling all of us to stay in touch of all the discussions, simply by looking at Google Groups, or e-mails. There were many initiatives taken by the MobiMOOC participants, but one in particular might be of interest to all of you as it uses a wonderful (mobile enabled) crowdsourcing software: the MobiMOOC crowdsourcing map built by Sean Abajian (this is where the picture in the post comes from). If you want to stay in contact with some of us MobiMOOC'rs, a linkedIn group was started as well. How to publish a virtual classroom recording into a mobile accessible format? With Camtasia you can record the screen and audio of the virtual classroom session. You can then edit the recording (maybe shorten some points, or skip immediately to where the session starts without the intro). After the editing you can produce the movie into a format of your preference (mp4, mp3 are most common and cross-device mobile standards). 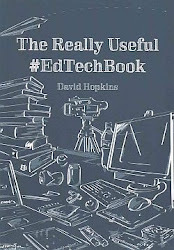 After I have produced my virtual classroom session into mobile formats (e.g. mp4 or mp3 for audio podcast), I cut them up into videos no larger than 15 minutes and load them up to youtube (youtube does not allow videos larger than 15 minutes at first). This allows people with a variety of devices to look at the reformatted virtual classroom movies, as YouTube will now offer those recordings in the mobile YouTube format. mLearning started out to be a more formal, corporate and academic field. After its initial phase a lot of inspiring more thrilling applications started to take shape. One of the most intriguing and inspiring sectors to explore mobile implementations for increased knowledge creation are the museums. So I thought it was high time that I had a peak at some mLearning or mExperiences from the art world. But I must admit, this overview could not be possible without Michael Sean Gallagher and other MobiMOOC'rs that provided these wonderful links. Mobile initiatives were always one of the key ways to get information across to museum visitors, just recall the audio guides, or the booklets that can accompany visitors. So it is no surprise that these heart and soul of museums everywhere are embracing the new mobile options that cell phones, tablets... are providing. Starting with the new initiative launched at the Paul Getty museum in Los Angeles. The Google Goggles team has worked with The J. Paul Getty Museum in Los Angeles to “Goggles-enable” their permanent collection of paintings. You can use the Google Goggles app on your phone to take a photo of a painting from the collection and instantly access information about it from the Getty’s mobile-optimized website and the rest of the web. It's possible to fit only a small amount of information on the wall next to a painting but visitors with Goggles can now enjoy the full story online. 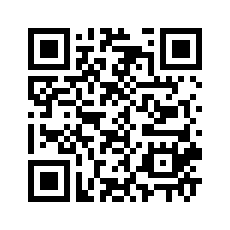 For more information about the Getty-Goggles project, visit mobile.getty.edu/gettygoggles or scan the QR code below. 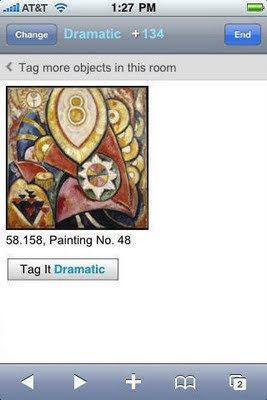 This is an initiative from the chief of technology at the Brooklyn museum (Shelley Bernstein) on a mobile application with which you can add tags to the paintings or art works that you encounter at the Brooklyn museum. The Gallery Tag! is in fact a mobile game, enabling people to add tags to art works, which (the tags) are then openly shareable with other visitors of the museum as well. Gallery Tag! 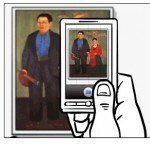 is a pretty simple mobile tagging game, specifically designed for use in the gallery. Select a tag or create your own, go find works in the galleries that match, enter accession numbers and earn points and prizes. You can either choose a tag left by other museum visitors, or you can add a tag describing your feeling or impression of a specific painting. Roam! One of our institutional aims of the Brooklyn museum is to get visitors looking across collections and that’s always a challenge in this very large building. To encourage players of Gallery Tag! to cross boundaries in the building, they gain more points if they tag objects on different floors. If you are coming here with your device hit m.brooklynmuseum.org to get started! Of course apart from the mobile apps that are provided by the museums themselves, there are also those mobile initiatives that are run by the visitors themselves. If you browse the Web, you can find many self-made museum tours (e.g. WalkExplorer for iPhone fans), a nice overview on how to build such self-made tours can be found here. For us Android loving mobilers, take a look at the mobile Android museum applications listed at the MuseumPods website which cover a lot of (mostly NorthAmerican) museums. If you are interested in interactive museum applications (mobile and others), be sure to link up with Nina Simon's blog called Museum2.0. She keeps track of great museum apps with wonderful interactions and is author of 'The Participatory Museum'. The MobiMOOC experience was (and is still) a blast. The MOOC format worked well and for many of the MobiMOOC'rs including myself, the knowledge that was shared amongst all of the MobiMOOC participants was incredibly enlightening. For those interested in getting into another educational MOOC, feel free to join the EduMOOC that will cover the idea of Online Learning Today and ... Tomorrow. This MOOC is organized by the Center for Online Learning, Research and Service at the University of Illinois Springfield and yes, it will be a great experience. Currently over 1800 interested people registered for the course. And each topic will be facilitated by a team of knowledgeable educational guru's. The EduMOOC uses googlegroups: When you're ready to participate in the discussions, you may go directly to http://groups.google.com/group/edumooc and they have a twitter hashtag #edumooc. As with all MOOC's this is a free course, so join all of us participants and register today. On the 4th of June 2011 I became a mother of Isaak. Ever since he is born he has been teaching me and I noticed that I have been a poor learner at times but willingly picking up what I can. All of a sudden all the books on cognitive learning, child evolution and so on fall into pieces. As always learning can only really happen when doing and ... from this time onward (if all the gods and sciences are willing) I will do it for the rest of this life thanks to this new life. I had never imagined that all of a sudden my ways of handling and taking care of the baby connects me not only to my deeper self, but also to my forefathers and -mothers, my peers and friends. In my actions I see and feel all of them, as if time is willing to lift up its veil for a moment and show me timelessness in Isaak's eyes. In his short life, I have been overheating him, under-cooling him, giving him not enough food, changing his diapers in ways he clearly stated was not the right way (apparently not to be used as a turban, nor low hanging skirt). On many occasions I simply looked at him with a startled face not knowing what to do. Time and time again he showed me what to do with basic feedback of cries and gestures, oh yes immediate feedback is important. This learning cannot be done on my own and there is no formal training. Parenthood is clearly learned informally and luckily it happens in collaboration with other, more experienced people who are willing to share what they know. It is startling to see how all learning follows the same paths. We probably could make a unified learning theory? So within two weeks Isaak taught me that in life we will always stay learners, and that a network of friends, family, connections will help each and everyone of us to find solutions enabling us to live a better life. I am humbled by his simplicity and the universal aspect of life and learning at every stage in our lives. And although people say babies learn the most, I feel they teach us even more. For those who wonder, Isaak is doing well despite my rather poor parenting skills, and he laughs at my feeble baby wisdom that I got out of books. His name actually means 'he laughs', and ... it fits him.